A mare from Wilkesbacka, Exessa. She is a full sister to *Edjora, the mother of the fabulous Kajora by Kaborr. Her father *Exelsjor (the only stallion the Poles wish they hadn't sold) was one of the chief progenitors of the Ilderim OA sireline. 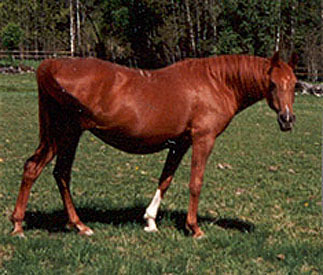 Kajora is the dam of Gazal al Shaqab who has been chief sire at Janow Podlaski. Before *Edjora was exported she left a daughter, Wiewiorka, that has continued the family. Exessa is the dam of several mares, among them Exalicja 1976 and Herbata 1983, and stallions *Exeter 1985 and *Essex 1986 by *Probat and Espri 1973 by *Espartero. She comes from the mare line of Woloszka, born ca 1810 at Slawuta, believed to be of a Saklawi strain. This line has two branches, through the daughters of the mare Rusalka 1911 (Czorsztyn x Polenta): Karima 1924 by Farys II and Niespodzianka 1931 by 35 Amurath II. Both mares were lost in World War II but left daughters to carry on. The Karima branch is the largest and has been very successful with horses like Celina, Ellora, El Azrak, *El Paso and Etna (one of my favourites!). Niespozianka left a small family through her daughter Laguna 1938 by Opal but two mares from this family has actually been imported to Sweden: *Lampka (*Gedymin x Laszka) and *Luna 1972 (*Elf x *Legenda). *Edessa by *Pietuszok was a daughter of Ellora and thus a halfsister to stallions *El Paso and El Azrak and full sister to mares *Elizaa and *Elba.